Cite this for Me extension for Chrome is an awesome addition for any blogger, student or would be author. 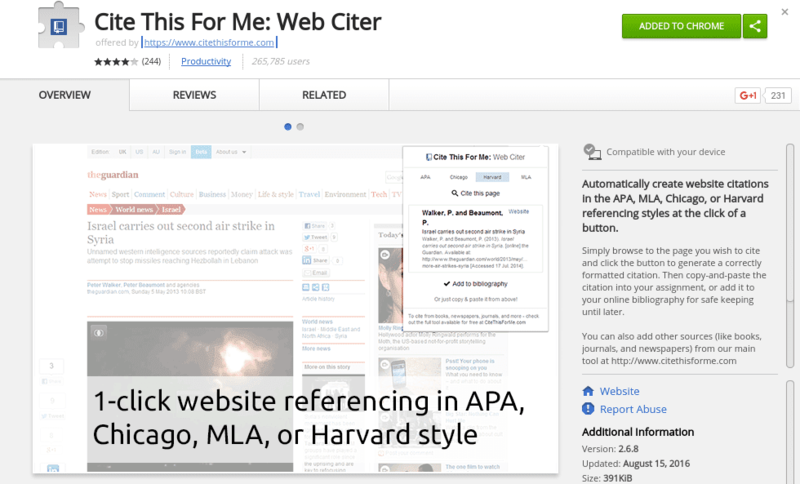 The add-on allows you to create citations directly from a website with just one click. With support for the 4 most popular references, you can quickly add APA, Chicago, Harvard or MLA citations to your work in a flash. The ability to cite publications on the fly could potentially save hours of work and the extension will make sure your citations are accurate every time. Another really neat feature is the ability to add specific quotes to your citation by just highlighting the text you want on the page. Once you’ve added any optional text from the site just click “add to bibliograpy” and Cite this for Me will open in a new tab where you can edit and save your citation. From there you can add even more references from books, journals, newspapers and more. The extension, as well as the website, are free to use. For a monthly fee, Cite this for Me will allow you to save all of your bibliographies as well as perform plagiarism checks on your work. Whether you’re an aspiring journalist or a scholar in the making, Cite this for Me could definitely be a useful addition to your publication toolbox. What Chrome extension can you not live without? Drop us a line or leave a comment below. I’d love to write about it.